A tricky qualifying session for Force India today, which didn’t really go to plan. 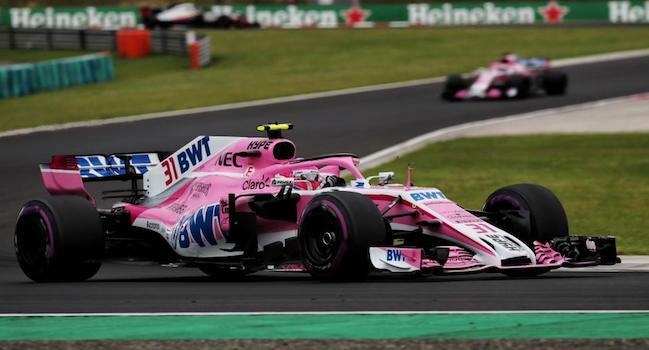 A brake problem held back Esteban Ocon and seriously compromised his qualifying session, especially towards the end when the track was improving. “It’s disappointing to be out in Q1, but we had an issue with the brakes that held us back. I pitted for slicks when the track was improving and my brake pedal went long. We tried to optimise the situation as much as we could, cooling down the brakes, but that meant I couldn’t drive the car at 100%. We definitely had much more than this in the tank. The weather out there was very tricky and we could have taken advantage of the conditions because normally we are really strong in the wet. Given all that happened, though, I am happy not to be last on the grid. We can come back tomorrow and we will push hard to make it back into the points,” says Ocon. Ultimately Sergio Perez didn’t set his times when the track was at its best and that’s why he dropped out in Q1 as well. “A disappointing session. We were expecting more rain towards the end of Q1 so we went out early to set our times and took the best out of the tyres. This really hurt us because the track was improving massively towards the end of Q1 and we didn’t complete our best lap when the track was at its best. Sometimes this happens when the weather is changing quickly, but we definitely had much more potential today. For tomorrow I think it’s a big challenge to recover if we have a normal race, but you never know what can happen and we never give up,” Perez added.